In Abby Carter’s everyday world, there are “black holes” in her All-American, small-town family. In these moments of no boundaries, Abby’s body is the pawn and each violation is stored in a place that cannot be recalled. An ordinary memory sits like a photograph in a family album. It’s always available to visit by thumbing through the pages. A trauma memory is not pasted in the photo album. It’s relegated to the attics of our mind to be stored where it can be ignored. A dissociated memory is ripped into pieces and locked in the basement of our mind without our knowing the photo was taken. This novel honors the wonder and beauty of resilient personal spirit. There was always a sweet day in spring when the sunshine finally became hotter than the cool breeze coming off the snow-capped peaks at the head of the lake. On that day, Abby was learning how to apply perfect layers of fingernail polish. Sitting on an old towel on the newly mowed lawn, she had filed her nails into even, gentle curves. It had been a challenge to follow the directions from the article in the Good Housekeeping magazine, but Abby had made sure she moved the file from the outer edge toward the center instead of sawing back and forth. After much effort and concentration, she was more than a bit pleased that all her nails were the same length and she was determined there would be no polish lapping over her cuticles. The ten cotton balls sitting at her side were testimony to her persistence. Scattered around the bottle of nail polish remover and covered with light pink, frosted, nail polish, they held the evidence of her efforts and filled the air with acetone. Abby’s nails were finally beautifully done, and, later than afternoon, it was the only thing she thought about when her dad led her down the basement stairs of the dental office. When he walked her into the darkness and shut the door, Abby couldn’t see into the far end of the windowless room, but she could feel the unusual thickness of her nails. The only light, coming from a second doorway, cast a weak, yellow glow and didn’t dispel the lurking depths where Abby was led. For her, there was nothing but the shadows in front of her and the new sensation of her polished fingernails. 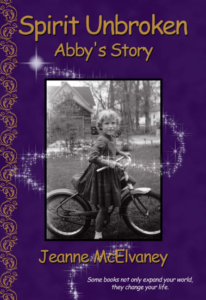 When Abby found herself sitting on the end of the table, those nails dug into the palms of her hands. Time stopped moving in ticking, forward progression. In the sea of darkness with her fingernails the only lifeboat, time became disjointed snapshots of sensations and impressions. The coarse contours of her dad’s face filled her view. His smile twisted as the pillow case came down over her head. A cough broke through the silence and dropped out of the air somewhere behind her. In a prison of fabric, her mother’s laundry soap assaulted Abby’s nostrils. Footsteps, coming from the slip of light behind her, scratched her soul. A vise gripping one knee and then the other sent streams of cutting pain up and down her legs. Cold, smooth metal on her stomach burned. The poking, prodding, panic, and pillowcase came together in senseless sensations. Abby couldn’t breathe. Under the suffocating hood, she felt the friendly hand of death reaching for her, but Abby’s body kept going, and the secret room in the corner of her mind gathered the mayhem of four men. Mind and body protected while those with power ravaged. This moment in time was placed in a thick safe, far from Abby’s knowledge about herself, but the lesson she learned would come out of the basement with her; she was on her own. The threat to her survival had spread into the ranks of Lakeville. That evening, Betty agreed when Abby suggested sitting on the towel earlier in the day had made her legs ache. This young teenager, who would soon leave 8th grade, sat with her little sister after they had taken their baths. She was going to re-apply the nail polish on her right thumbnail. All her other nails looked perfect, but that one nail had a gouge, and Abby was convinced she hadn’t let it dry completely when she had painted it earlier in the day. Ignoring the unexplainable soreness in her thumb joint, she plugged her hair dryer into the outlet to use between each of the three layers of polish and turned her attention to Katie. “Barbie definitely needed a bath tonight,” the 5th grader informed her older sister. “April and I took our Barbie dolls down to the beach and they got all sandy.” Under Katie’s sure hands, the well-endowed blonde with a tiny waist and feet permanently shaped to fit high heels was being relieved of her yellow bathrobe and shower cap. “What did they do at the beach?” Abby asked as she carefully applied the first layer of pink polish. “I like how Gramma has big bowls of raspberries in the refrigerator,” Katie observed as she placed the straw hat on top of Barbie’s head and looked at it. “You get to eat as many as you want,” she added with a sigh and moved the hat to the side so it slanted over one ear. Abby turned off the hair dryer and watched her sister moving the hat around, looking for just the right angle to satisfy some inner image she held. “Where’s Barbie going after you get her ready?” she asked Katie. “She’s going to bridge club,” Katie answered and laid her doll down so she could put on her short, white gloves. “Oh, does she like to play bridge?” Abby asked as she took the bottle of nail polish off the corner night stand and got ready to work on the second coat.